Formerly a favorite of internet marketers and web professionals, HostGator was known for affordability, ease of use, reliability, and top-notch US-based support. Under new ownership since 2012, much has changed for this low-cost shared hosting provider — and not necessarily for the better. While their shared hosting services remain low-cost, our page-load speed and uptime testing revealed that server speed and reliability have suffered. HostGator remains a major player in the website hosting industry, but some of the lustre is gone. On balance, HostGator has earned 4 stars and the NCM Online designation of RECOMMENDED WITH RESERVATIONS. A favorite of first-time webmasters across the globe, HostGator remains a popular low-cost host to which similar services are often compared. HostGator offers three low-cost shared hosting plans: Hatchling, Baby, and Business. All three include: the Weebly Basic drag-and-drop sitebuilder 4,500 website templates, 52 advanced website functionality scripts, numerous content management systems (WordPress, Joomla, Drupal, Magento, et al), and website transfer at no additional charge. The cheapest plan, Hatchling, features unlimited disk space, bandwidth, MySQL databases, subdomains, FTP accounts, e-mail accounts, autoresponders, mail forwards, e-mail aliases, and mailing lists. If you are considering building an ecommerce site, the Hatchling plan is not recommended as it does not provide for the addition of a private SSL certificate or dedicated IP address. Hatchling accounts are also limited to one domain hosted. The Baby plan includes all of the Hatchling’s features while adding unlimited domains hosted and parked domains. It also provides dedicated IP address and private SSL certificate options at additional cost. The Business plan is HostGator’s most advanced shared hosting solution. It includes all of the Baby plan’s features while adding a toll-free phone number for your business, anonymous FTP, a private SSL certificate, and a dedicated IP address. In addition to shared Linux hosting, HostGator offers VPS (virtual private server) plans, Linux and Windows dedicated server plans, and reseller hosting. HostGator utilizes a single-page order form. While we applaud their attempts to speed the checkout process, we do take issue with two of its features. After entering the domain name to be hosted, the next step is to select a hosting plan from the pulldown menu. What we found odd and possibly misleading about this menu is that the lowest cost plan (Hatchling) is not listed first as it was on the homepage. Instead the more costly Baby plan is listed first, the Hatchling is listed second, while the most-costly of the three, Business, is listed last. As the plan selection menu does not include pricing, a cynical person might believe that this was done intentionally to confuse shoppers looking to purchase the cheapest plan (Hatchling). After all, seeing the Baby plan listed first might reasonably cause one to assume that it is the least expensive. The second aspect of the checkout process that we take issue with is the fact that two added-cost options (SiteLock and CodeGuard) are preselected and have already been added to the order. While you are free to deselect them, we believe this to be a poor and perhaps even deceptive business practice. On a more positive note, the order form does present you with a total amount due for review, prior to submitting your payment. Fantastico Deluxe WordPress installation interface. Click to enlarge. NCM Online has and will continue to point out any and less-than-straightforward business practices — wherever and whenever we encounter them. Further we have and will continue to deduct from the ease-of-use and satisfaction rankings of any web hosting company that employs such practices. HostGator’s scores have been adjusted accordingly. As is our practice, we selected the lowest-cost Hatchling plan for review and testing purposes. We completed the purchase using the PayPal payment option. The “Welcome” e-mail arrived almost instantaneously after clicking the “Create Account” button. It included everything required to set up our website. We had the test site up and running on HostGator within minutes of our purchase. In keeping with their insistence on simplicity, all HostGator shared plans utilize the cPanel website control panel and the Fantastico Deluxe script installer. You need only complete the 8-field form (screenshot above right) to install WordPress on your site with a single click. 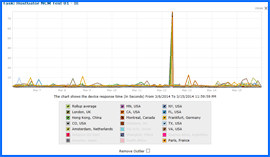 HostGator Uptime Test Results Chart. Click to enlarge. All web hosting services reviewed by NCM Online are purchased and subjected to our 10-day test for reliability and speed. 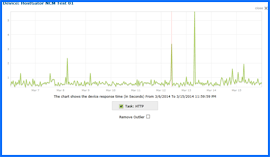 HostGator testing began on 3/6/14 and concluded on 3/15/14. The server began delivering DNS error code 12007 responses (the host name could not be resolved) on 3/12/14 at 9:51 AM EST. The problem persisted for nearly 17 minutes. In all 13 attempts to access the NCM Test Site failed. The issue reduced HostGator’s uptime percentage to a less-than-perfect 99.8821 (see screenshot right). No further reliability issues were reported for the remainder of the testing period. While we would prefer not to dwell on negatives, the reliability issues also negatively impacted HostGator’s average page-load speed. The host scored a sub-standard average speed of 2.0902 seconds to load the simple, one-page NCM Test Site from 13 locations worldwide, and 1.7962 seconds from the 7 U.S. locations. See screenshot below right. It is worth noting that had the testing concluded on March 11 — prior to the uptime issues — HostGator would have produce a respectable 1.4892 second average to load our site from the 13 worldwide locations, and only 1.2154 seconds from the 7 US-based test locations. HostGator Speed Test Results Chart. Click to enlarge. Rated A+ by the Better Business Bureau, HostGator’s shared web hosting plans are backed by a 45-day money-back guarantee and 24/7 phone, chat and e-mail support. One way in which HostGator goes above and beyond the competition is with its unique follow-up service. A company representative contacts you to make certain that you are satisfied with the service, and to answer any hosting-related questions you might have. Designed for first-time webmasters as well as internet professionals, HostGator remains a popular shared hosting choice. However, the service is not what it once was. HostGator has earned 4 stars and is recommended with reservations by NCM Online. Cheap website hosting company price comparisons based on 1-year term list price before coupon/promo codes or limited time/introductory offer discounts. These are the renewal rates for the second year of hosting. To ensure that you receive the most affordable HostGator pricing possible, please visit our Web Hosting Coupon Codes page for current discounts and special offers before making any purchases. HostGator is a popular web hosting service that provides the world with shared, VPS, dedicated and reseller options. This is a privately held company founded in 2002 by Brent Oxley and based out of Houston, Texas. It was during his college days at Florida Atlantic University that this innovative young many started his company in his dorm room. Since that time, this small hosting company turned three servers into more than 12,000 and became an industry recognized, world leader as a hosting provider. Over the years, HostGator has grown to serve more than 400,000 customers by providing them with innovative products and services that complement existing businesses. HostGator is now in more than 200 countries and serves Fortune 500 companies as well as individual freelancers. Due to the nature of reseller hosting, customers of HostGator often web developers or designers that offer their clients hosting services as well. All sizes and types of businesses effectively utilize this powerful shared and dedicated hosting service along with its shared and reseller rights. Customers from the newbie to the technologically educated all rave about HostGator. It was not until 2007 that the firm moved from Boca Raton, Florida and brought its offices to its new 20,000 square foot office building located in Houston, Texas and in 2010 it added another office in the Austin, Texas area. For its primary data center and network provider services, HostGator partners with SoftLayer. This long standing relationship allows customers to make use of maximum uptime and a world leader in networks as they power their own websites. The state of the art security, power, cooling systems, safety and data center features provided by the world-class SoftLayer, they know that service will always remain uninterrupted. HostGator servers are housed in multiple data centers on SoftLayer that ranges in size from 22,000 to over 78,000 square feet. These are world-class data centers that using industry-standard technology that ensures servers remain online, cool and secure at all times. The redundancy of these features include HVAC, and fire detection and suppression systems that are monitored 24 hours a day, seven days a week year round, by SoftLayer Network Operation Centers and HostGator both. A customer satisfaction survey conducted in June of 2008 showed that 90% of customers are well satisfied with the services provided by HostGator and its services. The services and support offered are top of the line and at the forefront of everything the company does every day. This company continuously works to refine and improve the services it provides as well as its customer support. This is what has helped it achieve its goal to become a world leader in web hosting on the global market. Along with Adam Farrar, who is the President and CEO of HostGator, the management team also consists of technology veterans of web hosting that collaborate to ensure that HostGator maintains its high standards of providing the highest quality of web hosting that it is known for. 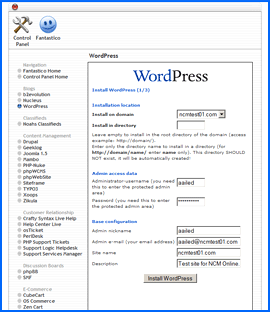 This video tutorial demonstrates the installation of WordPress on a HostGator shared hosting account using cPanel and the Fantastico Deluxe 1-click applications installer.